Something for everybody to enjoy! Register for Open Nerf Play Sessions! High Exposure is the premium facility in New Jersey for a unique experience of heart stopping climbing, adrenaline pumping ninja moves and extreme parkour tricks! We offer fun for families and kids of all ages! Our facility caters to our community needs; building strength and courage, while developing friendships that last a life time. 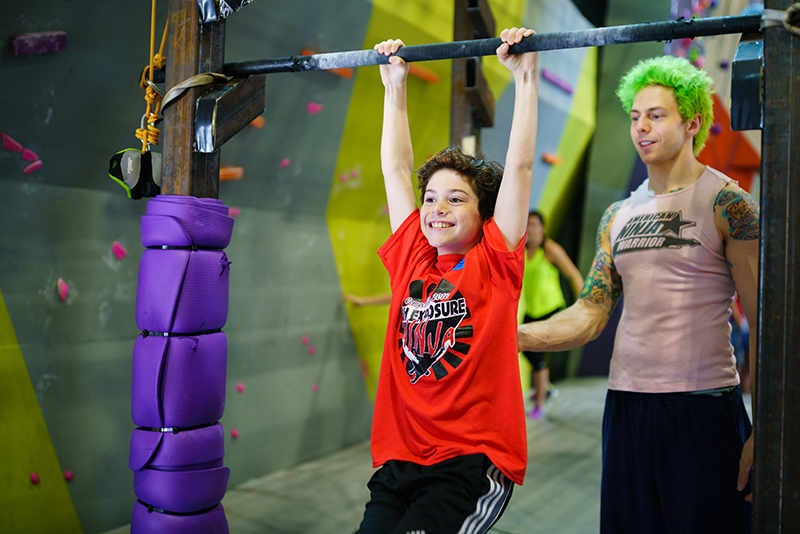 Ninja Warrior Camp is back this December! We have a National Ninja league competition today at High Exposure, the Bouldering walls and all ninja areas are closed today. We're looking forward to hosting Benjamin Franklin Middle School on Thursday and Friday morning, it's going to be awesome!! We have open nerf sessions ready to book this weekend! We're excited to welcome Bnei Yakov Yosef this Thursday at 11am! We will busy from 11am-1pm. We are expecting heavy snow Sunday night into Monday morning. To make sure our staff are safe on the roads, High Exposure will have a delayed opening, we will open at 12 midday. We have a university trip coming on Wednesday March 13th, busy between 11am-4pm! We have Link Elementary visiting High Exposure on Friday March 29th, we will be busy from 6pm-8pm! Saturday and Sunday morning Nerf open sessions are here for the weekend! We are closing 1 hour early at 7pm this Saturday (April 13th) to host a celebratory event for Erin! We are closing early at 7pm to get ready for a private event! Firday April 19th is Good Friday, busy day, we are open 10am-10pm! We're closing early on Wednesday April 24th at 730pm for a private event. We're excited to host Old tappan Charles de Wolf's 7th and 8th grdae on Friday from 8pm, it's going to be great fun (and busy). Monday May 13th we will be busy between 10am and 12pm, we're hosting the first visit of Icahn Charter School 3! Tuesday May 14th we will be busy between 10am and 12pm, we're hosting the week's first trip from Philips Academy Charter School! Wednesday May 15th we will be busy between 10am and 12pm, we're hosting the week's second trip from Philips Academy Charter School! During Passover High Exposure will be operating a 2 ½ hour day pass. Reduced Admission after 8PM Monday to Friday! Monday to Friday, 8pm - 10pm, $13 inc Harness. If you are looking for a non-traditional team for your kid to join, why not consider one of our super teams? Classes available for all ages, from 3-16! Call us today to set up a trial class $10 pp.